Tuition will get you a long way — but not all the way. Hope you’ve been saving those pennies! In “Build Your Own ‘UX Designer Starter Kit,’” I shared a list of everything I wish I’d known to bring on the first day of my UX Immersive course. Little did I know, that was just the tip of the spending iceberg. If you’re starting to put together a budget to underwrite a career pivot to UX that includes a full-time immersive or bootcamp, take some time to anticipate the additional expenses over and above what your program charges for tuition. The coursework is intensive, and it deserves your full attention — don’t miss out on any of the value of your investment by stressing about finances when you could be working on wireframes, polishing your portfolio, or getting a good night’s sleep! Some things won’t stop hitting your bank account. Make sure you have enough savings in place to cover the ongoing life expenses for the period of your immersive or bootcamp. Your rent or mortgage, utilities, car payment, credit cards, cell phone, toll road fees, groceries, and other expenses won’t wait until you land that shiny new job. If that means putting off your pivot until the next time the class is offered, that’s OK. You’ll get much more out of your experience if you aren’t panicking about your internet access being cut off, or having your car repossessed. Take your time to get ready. Some things can be paid for ahead of time. Once I was accepted into my program, I took advantage of the fact that I was still working and made a Costco run to stock up on toiletries, paper towels, pet food — anything I could think of that I might need and would keep for a few months or longer. Not only did I save a bit by buying in bulk, but the peace of mind knowing I won’t have to spend a dime on laundry detergent until 2022 has been deeply helpful. I put some “basics” on hold — news service subscriptions, regular haircuts, nonprofit donations, first-run movies. With class from 9am to 5pm every weekday, and homework and networking events most nights, you won’t have time for luxuries like Captain Marvel anyway. Though you may want to bookmark the website for design inspo. Some things will just cost money. Gas and parking. I made two critical mistakes: I believed the parking rates posted on the website for the building our classes would be in, and I waited too long to secure a spot. All told, parking for my three months of class and the occasional networking mixer, combined with at least a 20-mile round trip each day, has added up to almost a house payment. And in Austin, that’s not small potatoes. Research your parking options early, and lock down a contract as soon as you can. Take public transit, if that’s a possibility for your commute. And explain to your significant other that if they really loved you, they’d drive you to and from class each day. Neither of those options worked for me, but I believe in you. Lunch. Trust me: some days, you are just going to want to hit that snooze button more that you are going to want to get up and Tupperware something. Call it self-care. Spring for someone else to make you a sandwich or salad now and then. Sketch. Luckily, many programs can provide the paperwork you need to qualify for a 50% student discount off the regular annual price of $99. Get it! Once your first year is up, you’ll continue to have lifetime access to whatever version of Sketch you’re using. To get new updates as they are released, you’ll need to keep that annual license paid up. As of this writing, Adobe XD is a free alternative — but your instructors, and more importantly, your future coworkers may not use it. Check with your curriculum provider before you decide whether to pass on Sketch completely. InVision. Talk to your instructors about what tools they’ll be teaching and what skills employers in your market expect new hires to have. Some colleges and universities offer free classroom access to InVision for their students, so be sure to ask! If your program doesn’t, and you decide to spring for InVision (I did), you can get started for $22/month. #protip: InVision Studio (“Free Forever!”) is NOT THE SAME as InVision. Spend some time on their site to be sure you are accessing the tool you need for your course. Adobe Creative Cloud. As we say in UX, “It depends.” The program I’m in required pre-course work in both Adobe Photoshop and Illustrator, and I used a free trial to complete those requirements. As it turns out, we’re not using those tools in class, and technically I could live without them. But I want to master them, and to have access to other Adobe tools, so I bit the bullet and made the investment of an annual membership ($19.99/month). Adobe also offers student and educator discounts; it’s worth checking to see if your program qualifies. Domain name. Every website, including your UX portfolio, needs a domain name to be hosted online. New domains can cost about $10–15 a year, though they can go for as much as $50. Domains already owned by an individual or company are usually much more expensive, even if they’re not in use. I used Google Domains to get a few inexpensive alternatives while deciding which fit best with how I wanted to brand myself. There are plenty of other sites out there as well where you can purchase your domain, and some services like Squarespace and Wix offer domain name purchases as part of their hosting packages. Website and hosting. Once you have a place for your portfolio to live, you’ll need to build your site and pay a hosting fee to keep it open for business. If you are comfortable with HTML and CSS, WordPress might be your jam; if you want something simpler and need ecommerce, Weebly is super easy to use. Most people I know put themselves somewhere in between and use Squarespace. You can get a personal account for $12/month or a business account with all the bells and whistles for $18/month. Headshots. Your portfolio will have an About Me page, and your About Me page will have a photo of you. This pic will also be on your LinkedIn page, your Twitter bio, your Medium profile, your Insta feed…so make it a good one, and not, uh, just a picture of your feet on a whiteboard (don’t worry, I have an appointment set up with a photog). Depending on your market, you can get professional headshots for $100–150, which includes an hour session, an outfit change or two, and four to six edited images. It’s worth it. External monitor and mouse. I don’t care how awesome your laptop is, there will be days when the trackpad gives you hand cramps and trying to see gridlines on your 13-inch screen is asking for a migraine. Spring for an external mouse and an adapter to connect your laptop to that big old desktop monitor in your closet (or your neighborhood thrift store). 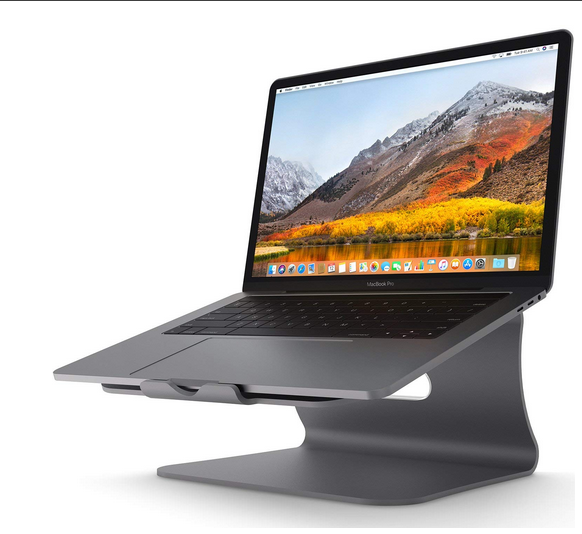 If you’re stuck with a laptop, consider investing in a laptop stand, and maybe even an external keyboard. Your neck will thank you. Other people’s coffee. Schmoozing is like dating. If you extend the invite, you pick up the tab. It’s the least you could do for all the career wisdom that folks will be dropping. Some things can get taken right off your list. LinkedIn Premium. If you’re desperate to try it, you do get a free month. The advice I’ve gotten is to activate your trial period after you are a few weeks into your job search (and remember to turn it off before you start getting charged for it). Sketch plugins. Except for Craft (which has its own issues), a lot of them are buggy and finicky. Sketch is pretty powerful on its own: make sure you are bumping up against the limits of the program before you start introducing new elements that might crash your life’s work. Meetups. Join them. Love them. Sign up to attend them. And cancel your RSVP if you can’t make it. Google Voice. There’s no need to be publishing your personal Batphone number all over the World Wide Web. Get yourself a free Google Voice number that forwards to your phone, and put that number on your resume and job applications. It’s free, and you can cancel it at anytime. #protip: Load the Google Voice app on your phone so you can see when you have messages. Don’t miss that job offer! Extra email address. If you’re already on the Google, take a second and make yourself a free email address that you can use for all your UX mailing list subscriptions. Send UX Collective and Jared Spool to a special mailbox you can pore through when you’re ready for research reading, and keep your personal mailbox neat and tidy. Tutorials and videos. There is so much free wisdom on the internets, including software tutorials on sites like Lynda.com (one free month for anyone — check with your local library to see if your library card gives you additional free access) and CreativeLive.com. You can see free videos of luminaries of all kinds on Ted.com, and with your annual membership to the Interactive Design Foundation (about $150), you get unlimited access to a wide variety of beginning, intermediate, and advanced classes and lessons in all types of design. Class won’t cover everything you need to know. UX your life by researching what you need, when you need it — and get as much of it as you can for free! Any established UXers have words of wisdom from their experience? What is your favorite free UX tool? What did you pay for then that you now wish you hadn’t? Sound off in the comments! Houli (Jennifer Houlihan) is a UX researcher and designer based in Austin, Texas. Follow her adventures here or on Twitter at @thejhoulihan. I am deeply curious, and as a UX designer, I love to connect dots, identify patterns, and organize information to drive action. Leslie Knope is my patronus.